CUMBERLAND — "I looked over Jordan and what did I see, coming for to carry me home? A band of angels coming after me, coming for to carry me home." The words of the spiritual were familiar in the mid-1800s to black men and women who stood on the southern bank of the Ohio River near Ripley, W.Va., staring into Ohio and freedom from slavery on the far side. Ripley was a "station" on the Underground Railroad where the escaping slaves would await help from friendly "railroad conductors" living in the nearby West Virginia hills. No doubt the slaves would sing, "Swing low, sweet chariot, coming for to carry me home...."
On Sunday afternoon a group of 75 area residents sang the old hymn again during a celebration of the Underground Railroad at another of the railroad's "stations," Emmanuel Episcopal Church in Cumberland. "Slaves would follow the Shenandoah River to the Potomac, and then travel along the C&O Canal towpath to Cumberland," said Ed Chapman, pastor of Emmanuel Episcopal. He said the bells of the church would ring out as a signal to the escaping slaves who found refuge in the Fort Cumberland trenches and tunnels that had been preserved beneath the church building. Chapman first learned that the church was most likely part of the Underground Railroad from Raymond Dobard, co-author of Hidden in Plain View: The Secret Story of Quilts and The Underground Railroad. Quilts were often emblazoned with patterns that held cryptic messages and then draped over a fence or wall where the slaves or their "conductors" could easily see. During a Heritage Days festival a couple of years ago, Chapman asked Dobard about a quilt that had an emblem of what looked like a pile of blocks under two bells. The quilt pattern was apparently used to inform fugitive slaves that they could seek sanctuary in a church in this area, according to Dobard. The church turned out to be Emmanuel Episcopal. Chapman said from Cumberland the slaves could make their way into Pennsylvania and freedom in the north. Stephanie Gates of Queen City Tours, and a local Underground Railroad historian, noted that although the complex system of safe houses, hideaways, and "conductors" known as the Underground Railroad existed. between 1820 and 1865, laws penalizing anyone who sheltered runaway slaves were passed in the American colonies in 1642. "So we know there were enslaved people running away as early as the 1640s," she said. "And the first bounty was set on runaway slaves in 1672." Gates said Pennsylvania Quakers were among the first to establish anti-slavery societies in 1775, and in 1776 all language referring to slavery was omitted from the Declaration of Independence. "In 1820 Missouri was admitted to the union as a slave state," she said. "After 200 years a lot of people were fed up" and the Underground Railroad was born. One of the railroad's most famous travelers was Harriet Tubman, who escaped from slavery in Maryland, then returned to the south 19 times, leading more than 300 slaves to freedom in the north. During Sunday's celebration Allegany High School sophomore Candeayce Faison presented a living history characterization of Tubman. "Sometimes it seemed like all we had was our hopes and dreams of freedom," she told the audience. "Be thankful for what you have." Following Sunday's celebration bells tolled as the participants were escorted to the tunnels and trenches beneath the church. "This was a great program, I enjoyed it," said Ray Taylor of Cumberland. "My mother, Edith Taylor, is 108 years old. She came to Cumberland when she was five or six. She used to tell us stories about the Underground Railroad." Also participating in Sunday's event were Cumberland Mayor Lee Fiedler, County Commissioner Barbara Roque, Father Milton Hipsley of St. Mary's Church, the Rev. Rebecca J. Vardiman of Ellerslie United Methodist, the Rev. Anthony Washington with Dickerson African Methodist Episcopal Church, the Rev. Dan Wright with McKendree and Davis Memorial UM churches, and Te' Andra & Timesha Schockley. 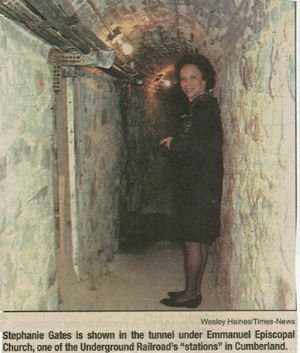 The photograph by Wesley Haines of Times-News shows Stephanie Gates in the tunnel under Emmanuel Episcopal Church, one of the Underground Railroad's "stations" in Cumberland.